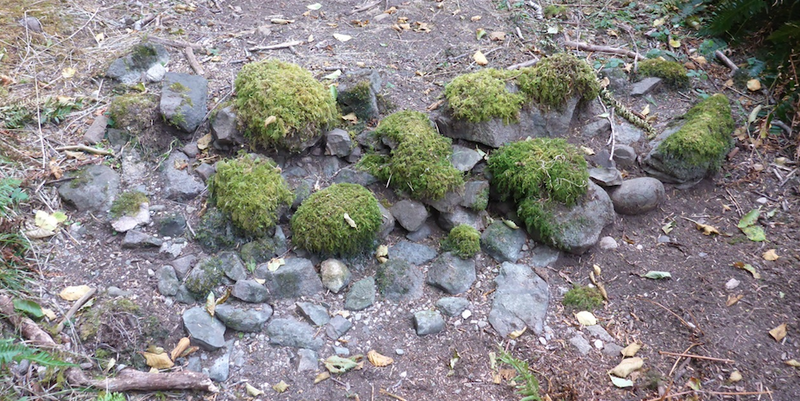 Detail of Taku Tlingit stone foundations. You don’t see that many cats in historic pictures on the NW Coast. It’s obviously a historic era structure – sawn logs, log-cabin style, fairly new at time of photography around 1887. The house to the right shows a more traditional style structure, while the one in the upper left is more of a western clapboard house. But all the same, the rough, yet sturdy, drystone wall is supporting a fairly large terrace cut into a steep slope and is quite educational from the perspective of expanding our range of mental models of what could be associated with NW Coast houses. I’m also looking at the upside down stump embedded in the bank to the left. Is that part of the terracing? Village of the Friendly Indians near Bute’s Canal. Watercolour by William Alexander. Source: University of Illinois. Multi-row houses on steep slopes are fairly well known on the NW Coast: see the picture above of one from Homalco Territory from the previously mentioned Houses on Stilts post. But even gentle slopes would have asked for levelling, perhaps. And what would be the reaction of hitting a pile of rock slabs in the bottom of a one metre square unit? Probably it’d be interpreted as the bottom of the interesting stuff and an indicator of sterile. Hard to shovel into, for sure! But the typical scale of NW Coast archaeology (big, big, complex sites and relatively small, small holes) often makes it hard to imagine really getting a handle on architectural details. Rock wall on Quadra Island. Anchors a small terrace rich in cultural material. Source: qmackie. For an archaeological example, above is a picture of a rock wall which happened to be exposed in a tiny rivulet. The wall itself is partially constructed of large stone tools, which is cool in its own right. It continues out of frame to right and left, but is not exposed in the same way. Behind the wall, a small test unit showed the stone structure three courses deep, with a definite edge, and abundant charcoal and lithics organized into thin strata like living surfaces. Preliminary dating shows use around 1500 years ago. Anyway, it’s an example of what we think may be a habitation structure of some kind built on a stone foundation, perhaps even with low stone walls as a perimeter. You can see numerous additional examples of similar walls in the pictures below, also from the SHI archive. It’s also not just about houses. Above and below you can see rock platforms built to support tents; in the lower case these are in the uppermost intertidal or immediate supra-tidal zone. The bottom picture shows a similar uppermost tidal rock platform which contained abundant charcoal dated to, if memory serves, to about 4,000 years ago. This is from Duncan McLaren’s Hakai Ancient Landscapes project which I get to volunteer on from time to time. So, stone: an under-appreciated construction material on the NW Coast? If you have examples of unorthodox stone constructions then leave a comment, or send me an email. This entry was posted in alaska, history, Northwest Coast, Technology, Uncategorized, Vancouver Island and tagged architecture, features, Heiltsuk, household archaeology, houses, photography, stone walls, tlingit. Bookmark the permalink. There are very few mentions in ethnographies of constructing dwellings from rock, or on rock foundations, that I can recall. This quote sticks in my mind (because it is the only one?). It is from G.M. Sproat’s 1868 ethnography of the Nuu-chah-nulth, “Scenes and Studies of Savage Life” (page 16). Although Boas doesn’t mention it, the rear half of such a house would have to have had a sizeable excavated/leveled floor in order to be “built on the ground” for the back half. Morley’s reference reminds me of working on Digby Island of Prince Rupert with George MacDonald (the summer of Woodstock and 1st walking on Moon….). I did the maps of the terracing and the shell midden strata appeared to show that the middens were built behind the houses so new terraces could be formed for houses to be built on in the future. In terms of Quentin’s interest in stone alignments and features, working at Ozette there were numerous areas were stones were moved on either side to form canoe runs–probably poles were placed parallel to the beach to create skids (we actually found these poles staked into the old beach at the 2600-3000 year old Hoko wet site). A good photo of one (Quentin cannot wait!) is in this useful web pdf source–all will find interesting overall–on page 18–a photo from 1961 by Louis Kirk, Ruth’s husband at the time: http://www.coastalwatershedinstitute.org/media/Nearshore$20Studynomaps.pdf. Those features should show up underwater if mapping like Quentin and Daryl did with subs this summer! Hi Dale, there was a great photo of horizontal canoe run poles staked into the intertidal zone in Victoria’s Inner Harbour as part of an outdoor photo exhibit of the historic era Songhees Reserve (there as of a few weeks ago). It was really neat to see blown-up versions of some of the historic photos (several meters across), and notice all the little details. When I saw these I was wondering how often these stakes might actually be found and possibly mistaken for the remnants of fish weirs; interesting that you identified these at Ozette! I checked Keddie’s Songhees Pictorial (2003) and there are a few relevant photos worth following along if you can get hold of the book… I got sucked into an interesting comparison of two photos. Page 80 shows a ~1963/1964 photo (“Indian Ranches, West side of Harbour”) of the same location. The poles are absent on the beach and in the haul-out gully. There is a canoe pulled up between parallel dark splotches on the beach which I assume are stakes. Hi Roger. It is really cool to see the detail captured in some of those historic photos – 8 by 10 inch negatives even! Which is why it’s disappointing in this day and age when online repositories like the BC archives offer such grainy, low-res images. They must have higher-res ones from the scanning process and it’s not like bandwidth is a concern anymore. I’ve seen a “canoe run” with the wooden elements still in place on Gardner Canal, but I suspect it may relate to historic logging. However, it is exactly as described, wooden poles laid like widely spaced railway ties across the clearing through the beach. I’ll see if I still have a photo somewhere. Interesting pointers, Ehpem and Morley. Dale, speaking of the cat, in that super-interesting document you link, I can’t help noticing the story of using a cat as a test bed for the presence of paralytic shellfish poisoning. Super interesting post qmackie (as always) and comments too. Thank you SO much for the link to the document, Dale. Great reading! Vince Cooke, a co-author, helped us from age 11 at Hoko and eventually was supervisor on the wet site at 16–one of our youngest Makah crew members. Currently he is in my Reservation-base class I teach part time at The Evergreen State College and he told me about this article on-line a few days ago–so just got it and have not really read through it–wild about the cats!!!! I bet in ancient times they may have tried it on village dogs, but would spare the valuable wool dogs! I got an interesting email from Chris Springer regarding this post, and the very cool picture he agreed to let me post, above. It’s from the Spring 2013 CAA Newsletter, 31(1):5-9, concerning an excavation on Ahgykson (Harwood Island), which is near Powell River, north of Texada Island, at a site called Mahlohhohm (“water bubbling up out of the ground”). It seems like there is a housepit site(!) dating to around 2600 calendar years ago (!!). This picture shows a clear horizontal boundary with black matrix to the right, clearly delineated by a very straight line which surely represents a rotted-away wooden plank? Anyway, germane to the blog post at hand, a series of granite slabs were lain down on sterile, and can be seen in the picture (the square corner in the black matrix is a trowelling mark). The stones were used in combination with sandy silt to create flooring within the house or within part of the house. The picture below shows the stones on top of the sterile silty layer. These houses are, by the way, very large — 13 to 19 metres across and don’t conform to a general impression of Locarno-era houses as being quite small. It does emphasize the size of feature vs size of unit issue we so often struggle with on the NW Coast. A 15 metre diameter housepit has an area of about 175 square metres. It’s a super-exciting find and many thanks to Chris for sharing his photos with us. Nicole: Just read the piece–yes real interesting! Melissa Peterson worked with us at Ozette too. Good to have Vince in the class. The TESC course is Ancient and Modern Northwest Native Basketry: Combining Cultural and S.T.E.A.M. (Science, Technology, Engineering, Art and Math), a 2 credit upper division class with students from Quinuault, Quileute, Makah, Jamestown S’Klallam, Puyallup, Nisqually and Muckleshoot. It emphasizes how to use basketry to help youth apply STEAM to find practical uses for these overall areas of study. The Native students provide the Cultural side and I show how we used STEAM to study ancient basketry–works pretty good. Cool! Thanks for sharing Dale. I just learned about STEAM on Friday in a conversation about combining traditional knowledge and STEAM around clam gardens. Will have to chat to you more about this. Would love to hear about your experiences. And, yes, I believe there was surfing had this weekend. Q and Chris, thanks for the post about the Harwood houses. Beautiful! Chris Springer’s work at this Locarno Beach site is very interesting. Hoko River dry site had dwellings and lithic artifacts of Locarno Beach style from 2600-3000 BP–and some interesting stone features in these dwellings, including slab lined pits. 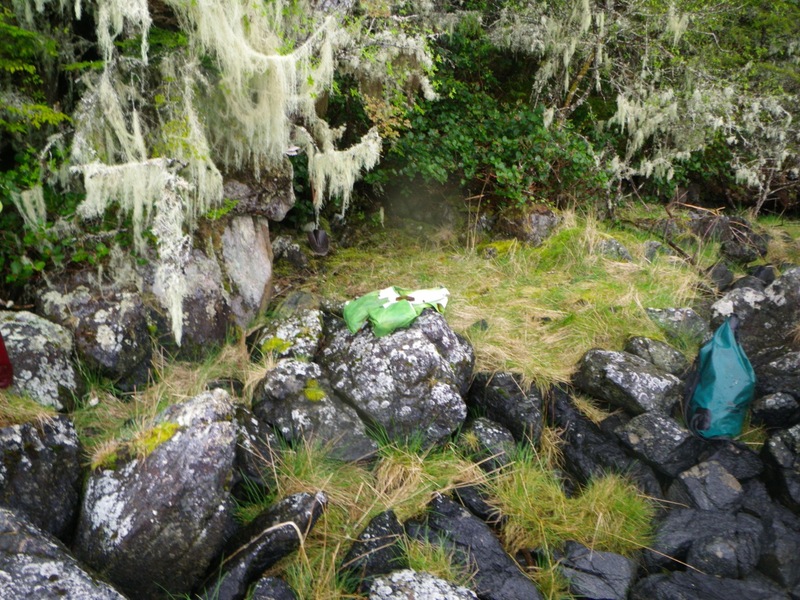 They were small surface dwellings at this halibut fishing camp and from post-hole features and common sewn tule mats and stick skewered bark board pieces found in the associated wet portion of the site, the dwelling appear to be campsite pole structures with sewn tule mat walls and bark board roofing. 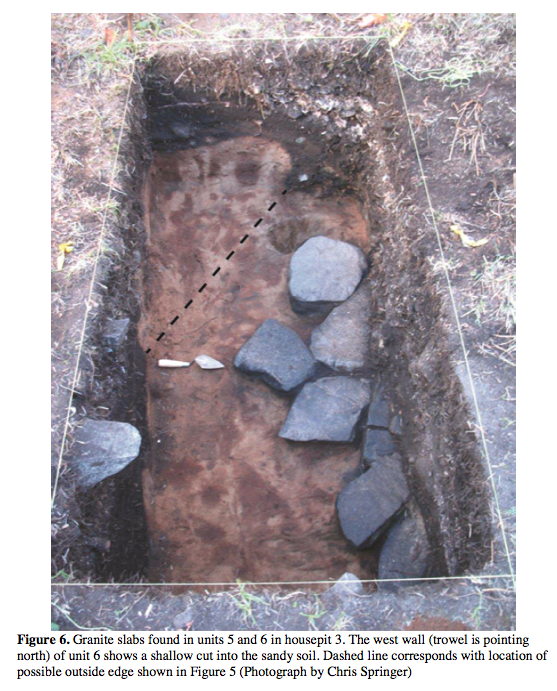 Take a look at the dry site (the campsite) strata section and also slab-lined pits in the Lithic section of the image archive for Hoko (also sewn tule mats and cedar bark boards in the wet site artifacts): http://www.library.spscc.ctc.edu/electronicreserve/anth280/hoko/ . Also the 100:1 model built with representation of these shelters and slab lined pits under Camplife section, Type: Model and Village Reconstruction. Hi Quentin, more awesome stuff, thank you. With regard to near shore stone structures I look to Doug Deuer’s chapter in “Keeping it Living” (2005), entitled ‘Northwest Coast Estuarine Gardens as Engineered Environments’. Lot’s of good detail there about modifying the near shore environ and piling up stones etc. Not sure if any of these features have been recorded archaeologically (other than the Nimpkish River Gardens) as gardens, possibly some as fish traps or clam gardens? Again sea level history is critical to understanding the possible function of such near shore features which may have served multiple functions as shore morphology changed through time. 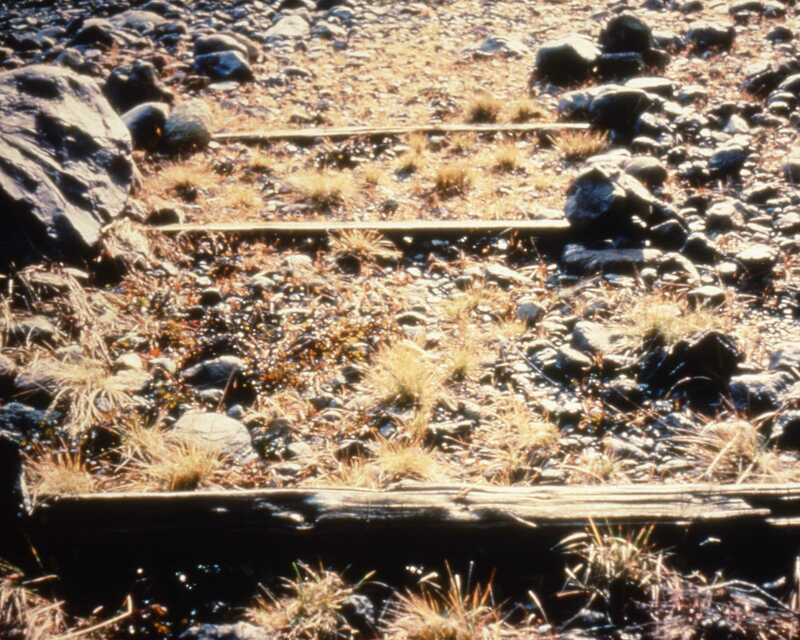 Some of the rock features in the lower Fraser Canyon (between Yale and Spuzzum) look a lot like the house platform in the photo. In my dissertation (and now I wish I had that photo to use for comparison! ), I talk about how some of the rock features are likely bases for plank houses, due in part to the fact that the majority of them are terraces and are placed in areas without a lot of flat ground. I have a chapter submitted to a forthcoming volume on the Fraser Valley that goes into more detail about the structure and layout of a sample of rock features in the Canyon, and they are discussed in Schaepe’s 2006 American Antiquity article. I’ve also been using an RTK GNSS to map canoe runs in Prince Rupert Harbour. A lot of the large villages have significant modifications to the intertidal involving moving and stacking stone. I suspect that shell was used in the middens to create platforms, but in the absence of shell (or in parts of the environment, such as the intertidal, where shell would have been unstable), rocks were used in similar ways. Glad to see more examples of building with stone on the Coast! Jim — thanks for the reference. I wonder if in places of rising sea level, stone constructions became colonized disproportionately by edible rhizomes and this turned the light bulb on? In any case, for every place that gets cleared of rocks, another place must get them piled up, perhaps leading to unintended consequences of the good variety. Kisha – hi, and thanks for your note. I look forward to your chapter. I thin Darcy discusses how some burial cairns may be deflated mounds, and I wonder if some rock walls could be deflated terraces? Kisha: I look forward to hearing more about your dissertation–is it available on the web? Also the work in Prince Rupert Harbour mapping canoe runs. These were certainly visible at Ozette (in my above post). I suspect anywhere you have a camp/village with rocky offshore, you would move these rocks out of the way the best you could for bringing the canoes in. At Hoko River we found what appeared to be canoe runs on an ancient sandy/gravelly beach, since the strata in the wet site was perpendicular to the old beach, therefore we found spaced rows of alder poles (IDed cellularly) sticking out of the bank (on the old beach surface) and occasionally stakes were driven on their outer edges to hold them down and in place. We replicated these canoe runs, which are also mentioned in ethnographic accounts, and actually ran a heavy student built spruce (only big log around) dug out canoe up the skids and found it to be very easy for one person to skid the canoe well above the tide line, i.e. they worked great for heavy loads. Take a look at the VILLAGE RECONSTRUCTION and MODEL (a 100:1 model showing skids coming ashore) in CAMP LIFE IMAGES menu section under of our aging Hoko River Image Archive at: http://www.library.spscc.ctc.edu/electronicreserve/anth280/hoko/CAMPLIFE/INDEX/INDEX.HTM , especially Model picture: FOV00687 and Village Reconstruction pictures: AOG00787 and AOG00187. Anyway these rock features are no doubt only where they had to be created for canoe runs, otherwise, unless a wet site, doubt much of a feature would remain of these runs. Though I am sure they were always there to help bring in canoe loads of products. Makes me realize I need to update my theses page with all the new awesome stuff from the last few years of the student world. Interesting post, and what a great picture. In the comments someone wondered what the garden features that Duer was researching might normally be recorded as. Some of the features he first worked on were on Meares Island in the upper intertidal zone which I had recorded a few years before his work – I called them as fish traps, though I was perplexed by their higher elevation in the intertidal zone. Off topic a bit, but one of my most startling experiences recording sites was on one of those features – I stepped over a wall, unable to see where my foot was landing. It happened to land on a dead crow, full of gas, which the weight of my foot expelled, causing a loud caw. Needless to say, I jumped a mile high. 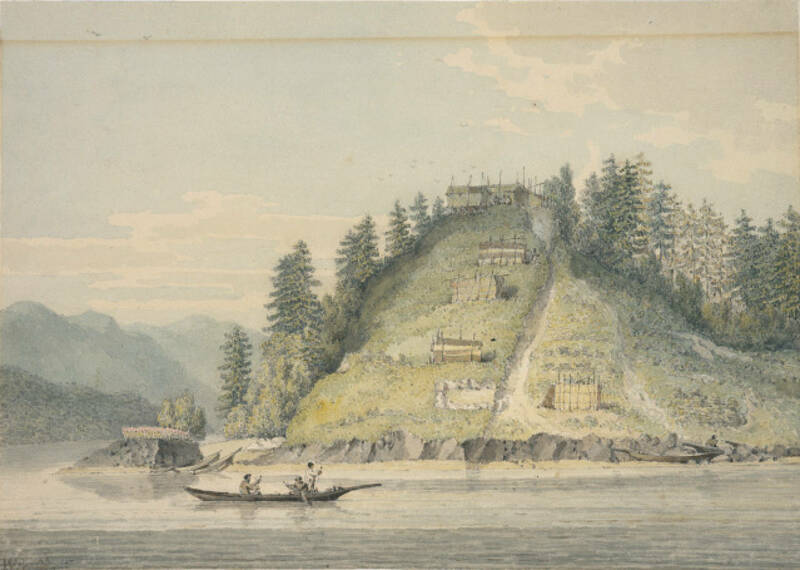 And, to tie other people’s discussions together a bit by placing things into a small bit of geography: I also recorded on Meares Island, with its many estuarine gardens (as Duer later taught us) and dozens of fish traps, a canoe run with split cedar skid planks still in place. Each skid was held down at either end by rock piles, and/or jammed under large rocks. I have no idea how old it is but am guessing it was mid-century, though it could have been maintained from a much longer time than that. It was at the head of Mosquito Harbour where there is a trail across to the channel on the north side of Meares – the trail was used for bird hunting by local First Nations, if I recall correctly my discussions with an elder on a revisit to the area. This may be a little off topic, but taking “unorthodox stone constructions” literally: a number of long narrow (e.g.15m x 2.3m, 11.2m x 3.0m, 10.5m x 2.0m) presumed burial cairns at Albert Head in Greater Victoria, and one shaped like a big elliptical doughnut, 15m x 9.5m. Located in the midst of a “mortuary landscape” of many more commonly-shaped cairns. Unorthodox, maybe, because they’re not found anywhere else on the NW Coast that I’m aware of – with the exception of another doughnut cairn appearing in an 1896 photo at the RBCM (can’t find it online!). These cairn types don’t appear in Darcy Mathews’ MA or PhD theses, because they aren’t found at Rocky Point. His committees rightly advised him to constrain his (already huge) study area. I came across a curving stone bridge above the middle Nass River in Gitanyow territory on a historic grease trail (have picture somewhere). The bridge was built over a small seasonal melt water creek and was about 100cm tall and 3.5m long. The trail was still clearly visible on both sides. I’ve been very curious about the popular notion of absence of stone use. Thanks for this post.